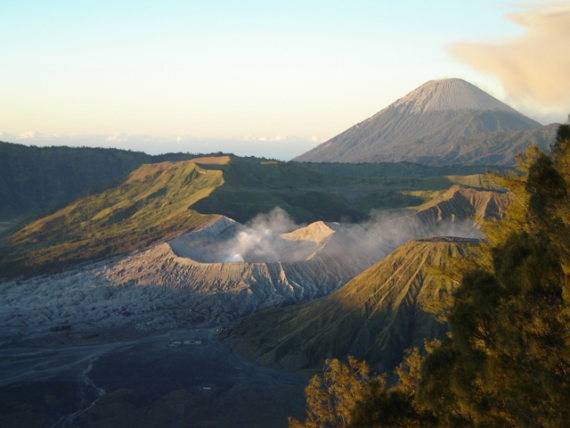 A famous, perfect volcanic cone in east Java. Descend the wall of a huge ancient caldera and cross a sea of sand before making the ascent. Climb at night for spectacular sunrise views. Approaching from the north, you need to ascend some 3km to the rim of the Tengger Caldera, then drop another 3km down the steep face of the Tenggerwall (not wholly easy at night), then cross the wide, desolate sea of lava sand that fills much of the Tengger crater. 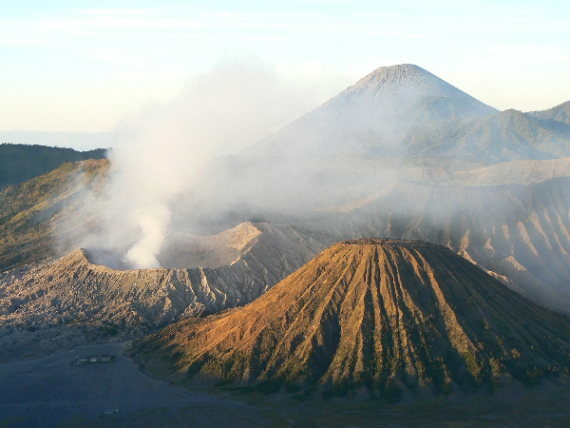 The final climb up Bromo itself is a puff, although not that bad. 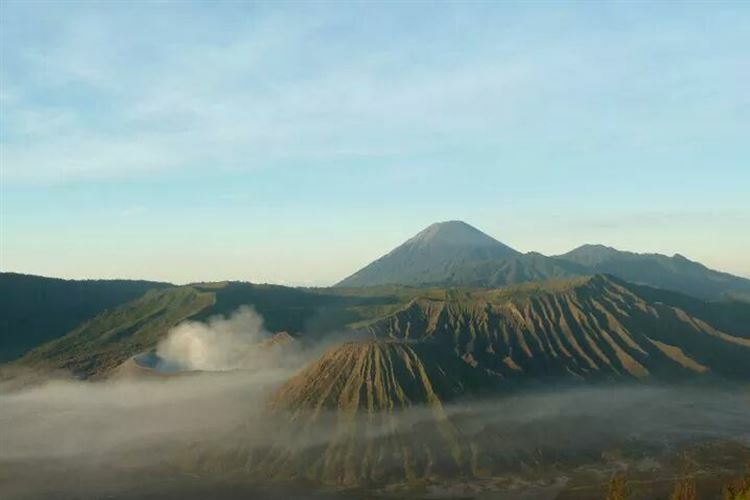 The deep, active crater is fascinating, but the views out over the huge old caldera to the outer rim-cliffs, with 3,676m Semeru to the north and elegant Mt Batok Batok to the south(ish), in the atmospheric early light is your real reward. 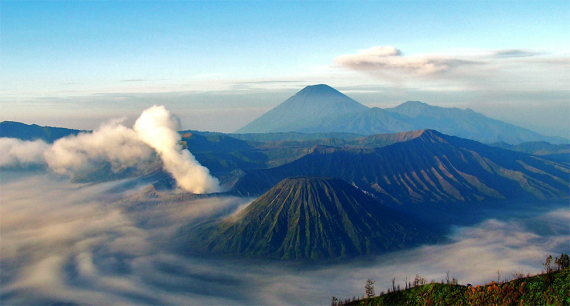 Most people climb Bromo at night, to catch the sunrise. It is cold, so come with the right layers. It is really wet in the rainy season, so try to climb April-October. This page is at an early stage of development. Please help us by recommending your best walks and sending photos! Thank you! If you have time, and are not taking a tour, it is possible to walk the rim of the caldera from Cemoro Lawang towards the road to Ngadas (which also goes off towards Semeru. The caldera rim gives views across the crater as well as towards the coast, and is easily followed until a steep zigzagging path leads down to the inside of the caldera and joins the main track. I was fortunate enough to see my Brocken Spectre down in the caldera as I walked. 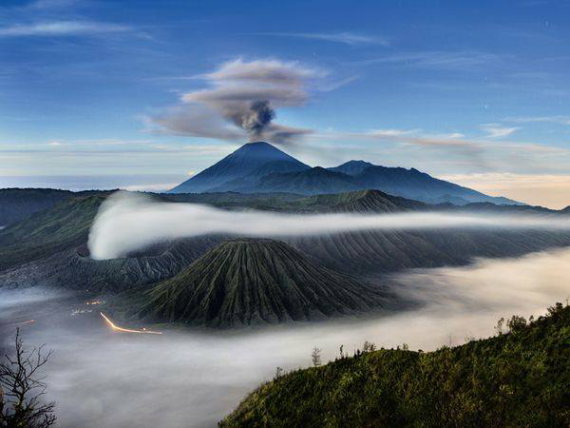 Bromo certainly repays a longer visit than the sunrise-and-morning most people give it. Don't just see the sunrise and then go down again. The most interesting light effects happen in the hour after sunrise, particularly if there is cloud as well as smoke from the volcano.